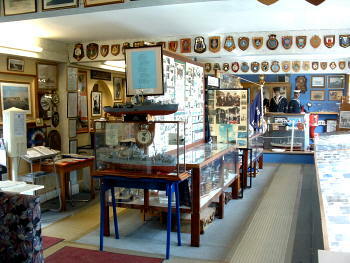 The Museum is located in 'The Stannard Room' on the first floor (the floor above the ground floor, access only via a flight of stairs) and includes the 'slops' shop; and 'The Europa Room' (on the ground floor); both are in some of the few remaining original buildings of HMS Europa in Sparrow's Nest, Lowestoft. Lining the walls of the Europa Room are the 17 boards listing the 850 or thereabouts honours won by members of the RNPS during WW2, including a VC, along with a list of over 200 'Mentioned in Despatches'. The VC was awarded to an ex-Merchant Navy officer, Lieut. Richard Stannard, of the Hull trawler Arab, during the Narvik campaign. Lieut. Richard Stannard steamed his ship into Namsos harbour on August 16th, 1940, to fight a fire on the pier which threatened to blow up an ammunition dump. His junior officer, Sub-Lieut. E. T. Lees, R.N.V.R., was awarded the DSO and three other members of his crew received decorations. There is also a record of the CBE awarded to Commodore Daniel de Pass for his services at the 'Nest' during WW2. 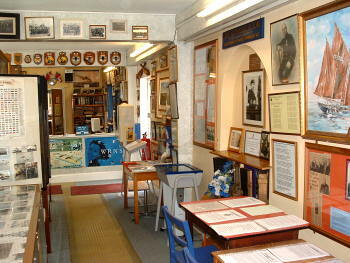 In addition to a mock-up of a wheelhouse there are numerous small exhibits including photographs and models of many of the ships of RNPS and much war memorablilia such as shields, uniforms, flags and personal possessions. The photographs illustrate many of the members of RNPS at their various duties, in many parts of the world and at various locations in Lowestoft. Many include unidentified members and so if you visit and can recognise anyone we have not identified please let us know. 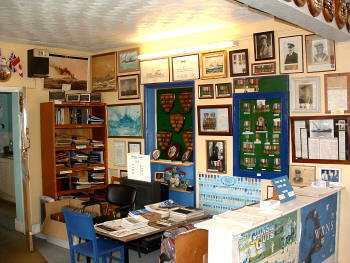 ......Museum opening is subject to the availability of volunteers to see you in. As with all volunteer run enterprises the planned opening times cannot always be relied on, so if you are travelling a long distance to visit it will be worthwhile checking in advance whether or not the museum will be open and if possible arranging an appointment. Admission to the Museum is free but donations to assist in its maintenance will always be gratefully received.